Wilson castle was begun in 1867 by Doctor and Lady Johnson. Lady Johnson provided the money and presumably helped design the castle. After 7 1/2 years of planning and construction, the castle was completed at a cost of $1,300,000. From the 1880's until 1939, the castle was bought and sold about 4 or 5 times. In 1939, a radio engineer named Herbert Lee Wilson bought the castle. He was a pioneer in the AM radio field and thought the castle would be a good location to build another station, as well as provide a summer home for his family. He installed radio station WHWB in the old stable, which remains in operation. Herbert Wilson joined the Army Signal Corps during the second world war, and retired in the 1950's. After the war was stationed in Europe and Washington. He retired to the castle, and in 1962 opened it for tours. He died in 1981 at the age of 82 and left the estate to his daughter, Blossom Wilson Davine Ladabouche. She still owns the property and makes her summer home in the old servants'quarters, which have been redone for her use. 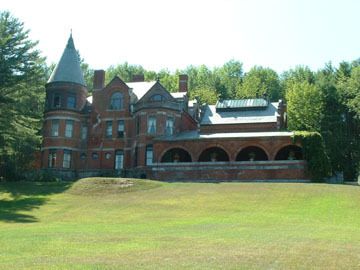 I have enclosed a picture of Wilson Castle from Proctor Vermont that you may like to put in place of the current one you have because the snow, I feel, tends to paint a very cold, harsh image of an other wise great and comfortable castle. I have visited the castle several times and each time is a unique visit to discover new things about the castle. Castle photo by Dan Godlewski.